Wrekin Grasstrack Club brought the curtain down on the 2017 Formula Grasstrack championship on Saturday. 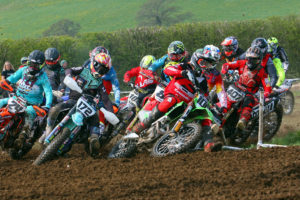 The Alveley venue produced some fantastic racing to finish the season and didn’t hold any surprises with the championship leaders sealing their respective championships. Ollie Binns continued his successful year with a full maximum to take the Auto Cadet title to go alongside his silver British championship medal. Jack Crewe improved all day as he has all year to take 2nd place and 2nd in the championship. Crewe will be looking to move up to the cub class to join brother Joe in 2018. Once more the Cubs were joined by their elder rivals the Junior class in each race. Champion elect Billy Budd used his fast gating to mix it at the front with Juniors Sam Hall, Eli Meadows and Katie Gordon. Budd taking a heat win in his 5th race and racked up a full maximum in his category to win the meeting, take the Mary Dudgeon trophy & win the Cub championship. A superb year from the youngster from Ellesmere Port. Joe Crewe continued his improvement despite mechanical problems to take 2nd in the cub championship. Sam Hall went on to clinch the Junior title with a full maximum in the Junior class. After sharing the title in 2016 with Jack Budd, Hall put on a masterclass in 2017 winning 7 of the 9 rounds on his way to the title. He had to work hard for the victory on the day, having to pass Meadows and Gordon in some rides. Meadows and Gordon taking 2nd and 3rd respectively on the day and in the championship. Ryan Ashcroft was odds on to take the Senior championship despite a tough line up in the Senior class including Graham & Phil Thomas, Richard Guest & Colin How returning to the FGA for the final meeting. Ashcroft started the day off in immaculate form and was looking to be favourite to take the Sheila Reece trophy reeling off 3 straight wins whilst younger brother Liam also matched him going unbeaten to the interval. Disaster struck for the championship leader when leading his 4th ride, his Honda engine cried enough three races short of finishing the season. For his fifth outing Ryan was lent Wayne Broadhurst’s machine (Broadhurst spectating at the meeting bringing his bike along for friend Martin Adams for a spare) and duly took the race win before disaster would strike again in his final ride when Broadhurst’s machine would give up on him. Leaving Ryan with 7th on the day and leaving him without a machine for the finals. Despite his nightmare meeting the Tividale man went on to Clinch his 1st Senior title in a season which has seen him develop as a front runner on the Main Grasstrack seen in both the 350 & 500 Classes. Younger brother Liam went on win his last 3 rides to give him a 6 ride maximum going into the final. This was enough to project him from 4th to 2nd in the championship. Former 250cc champion Graham Thomas dropped one point to Liam took 2nd place with Richard Guest and Phil Thomas tied for 3rd before the final. Shropshire veteran Glyn Stanton was consistent all afternoon to take 5th place and take third place in the championship from fellow Minsterley member Martin Adams who struggled despite a race win. Solihull’s Marcus Crutchington race to 6th overall and moved himself up to 5th in the championship after some impressive rides. In the Sheila Reece final Liam Ashcroft made another great start to take a tapes to flag win. A fantastic performance to finish off a great season for the youngster. 2018 may prove interesting as the brother’s from Tividale are evenly matched on track. Former FGA champion Richard Guest claimed 2nd place with Shropshire’s Phil Thomas taking third. Graham Thomas came home in 4th after challenging Ashcroft in the early stages of the final with Stanton and Crutchington come home in 5th and 6th. Notable performances by young men Jack Budd and Nathan Alder. Budd in his first full season in the adults is looking more confident each meeting whilst Alder was making his debut in the Adults after stepping up from the Juniors and but in some great rides. The 2018 Formula Grasstrack season commences with the 2017 Awards night on the 20th January with the race season starting in Early April.